Basics of animal breeding have been covered earlier in this blog. We've discussed the very basics of animal breeding as well as the Mathematics of animal breeding . Optimization of animal breeding schemes has also been briefly considered. Today we take a closer look at calculating the breeding value using statistical concepts and information from various sources. When calculating EBV (estimated breeding value) for an animal, we usually want to combine information from various sources. We have results from the animal itself, but also from its relatives. However, EBV is always for one trait only. where Â is the EBV, y1 is the animal's own result in trait 1, μ is the population mean result in trait 1, a1 is the additive genetic effects contributing to the trait and e denotes the environmental factors contributing to the trait. Simply put: an EBV consists of genetics and environmental factors. Here P and G are matrices. P includes the variances and covariances between phenotypic results. The marking P-1 simply means that the transpose of the matrix P is used in the calculation. G is another matrix, which links the information sources to true breeding values. 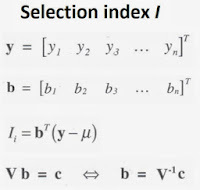 In the G matrix Ai denotes the true breeding value of animal i. Info1 and Info2 below are different information sources, for example animals 1 and 2.
where a(x,y) is the coefficient of genetic relationship between animals x and y. If x and y are full siblings, their coefficient of genetic relationship is 0,5, and Cov(Info x, Ay) = 0,5 Var(A). If they're half-sibs, it's Cov(Info x, Ay) = 0,25 Var(A) and so on. s.d. (P) is the standard deviation of the trait P, or the trait for which we are calculating the breeding value for. Standard deviation of P is the square root of the variance of P.
So now we can calculate the EBV for one trait. What if we want to combine several traits into one number? Then we need a selection index. It works like EBV, but combines information from several sources and several traits into one. 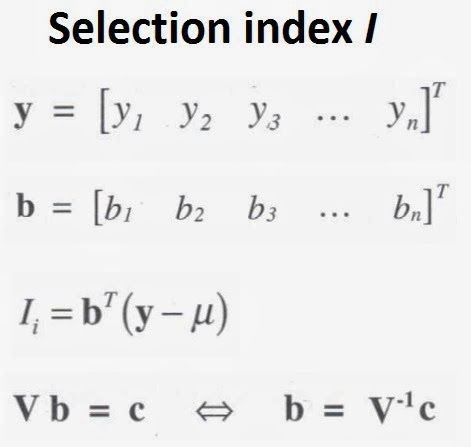 A selection index can either be optimal or common. The difference is in the coefficients: optimal coefficients minimize the variance between true breeding values and estimated breeding values. In a common selection index the coefficient b is said to be "any b0", but in the optimal index b = P-1Cv. The optimal index considers covariances, and breeding accuracies impact the b coefficients. 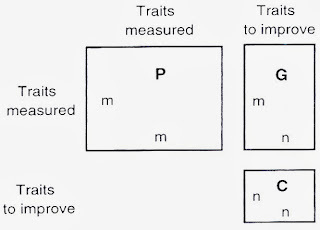 Here we can see a new matrix, C. C is used if the measured traits are not the same as the traits to be improved. For example, we might measure weight and thickness of back fat, but we want to improve weights and percentage of lean meat. Now we need the matrix C, which relates to the other matrices as shown in the picture below. If we want to include money to the calculations, we get a total breeding value. Money is used in breeding values to give economical weights to each trait. This weight is entirely decided by animal breeders, and based on what they think is most important. Economical weight isn't linked to genetics or phenotype in any way. It is simply a way to put the traits into some order of importance.Often economical values is derived from actual profits or costs regarding the trait in question. The weight is currency per 1 unit of increase/decrease in the trait, for example euros per +- 1 kg of meat or dollars per +- 1 weaned piglet. The economical value can be used to ompare the costs and profits between different breeding schemes. We have two schemes for pig breeding. One scheme gives us - 0,5 piglets per sow, but 10 kg more meat since the surviving piglets are heavier. The other scheme gives + 0,7 piglets but -6 kg meat. Let us assume that 1 kg of meat is +10 euros and 1 piglet is 15 euros. Now the first scheme yields (-0,5 * 15) + (10*10) = 92,5 euros, and the second scheme (0,7 * 15) + (-6 * 10) = -49,5 euros. With these exaggerated numbers it is easy to see which scheme would be more profitable for the producer. 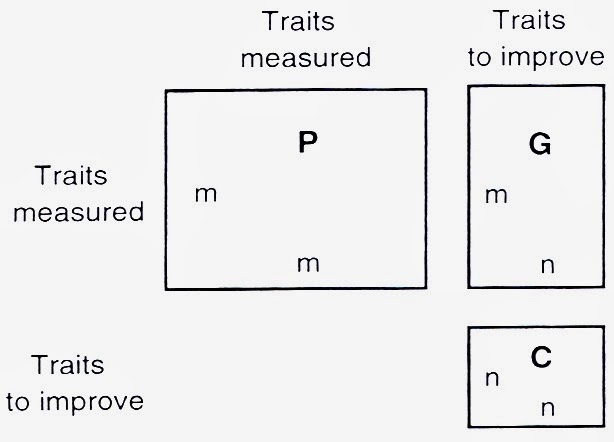 G = covariances and variances between traits to be improved and measured traits.